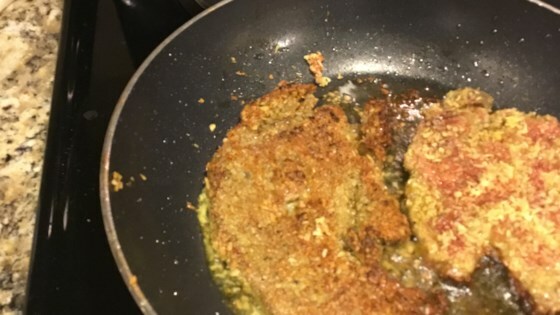 "This is the best way to make juicy and tender liver. Even the kids will enjoy this!!!" Place bacon in a large, deep skillet. Cook over medium high heat until evenly brown. Transfer bacon to a plate, reserving a small amount of grease in the pan and the rest aside. Pour seasoning coating mix into a large resealable plastic bag. Place calves' liver in bag one slice at a time; seal, and toss to coat. Cook liver in bacon grease over medium high heat, turning occasionally to brown both sides. Depending on the size of your skillet you may need to work in batches and add more bacon grease. Liver is done when juices run clear. Return bacon to the skillet during the last 2 minutes of cooking to warm through. Serve hot with your favorite side dish. Very nice and easy to put together. I used baby beef liver and threw in some sauteed onions. Phenomenal! I didn’t have the seasoning, so I dredged in flour with some garlic salt. Then I added chopped onions to the bacon grease. Sooo good. Best liver ever.